When we first saw this new gadget, we thought “Oh, a mechanical toothbrush powered by the sun.” But that isn’t what this is. Instead of using solar rays to charge itself up, the toothbrush uses them to catalyze a powerful chemical reaction that could leave your mouth way cleaner than regular old brushing does. “You see complete destruction of bacterial cells,” says Kunio Komiyama, the inventor of the device. Oh, and did we mention that no toothpaste is required? Watch out Colgate! 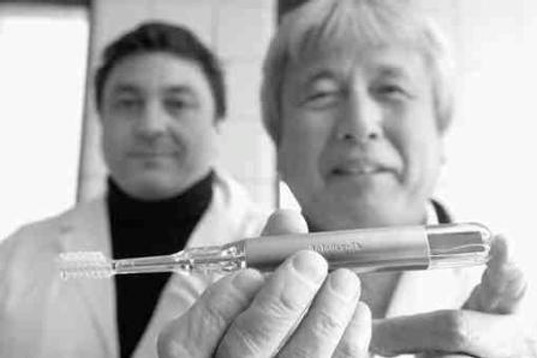 Mechanical University of Saskatchewan dentistry professor emeritus Dr. Kunio Komiyama and his colleague Dr. Gerry Uswak are recruiting 120 teens willing to brush with a prototype light-powered toothbrush and sit in a dentist’s chair for a few extra inspections. The manufacturer, the Shiken company of Japan, is paying the researchers to investigate whether the brush, which causes a chemical reaction in the mouth, does a better job of eliminating plaque and bacteria than a conventional toothbrush. 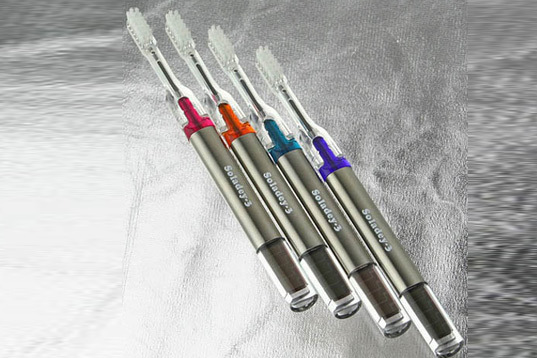 Komiyama’s first model, which was described 15 years ago in the Journal of Clinical Periodontology, contained a titanium dioxide rod in the neck of the brush, just below the nylon bristles. It works when light shines on the wet rod, releasing electrons. Those electrons react with acid in the mouth, which helps break down plaque. No toothpaste is required. Now Komiyama’s back with a newer model, the Soladey-J3X, which he says packs twice the chemical punch compared to the original. Protruding from the base of the brush is a solar panel, which transmits electrons to the top of the toothbrush through a lead wire. It won’t work in the dark, though – the brush needs about as much light as a solar-powered calculator would to operate. No bacteria producing acid = no decay, which would eliminate the need for fluoride all together. I think eliminating the need for foreign substances in our bodies is a good thing. I also doubt it would be any more likely to cause cancer than the normal materials we come into contact with on a daily basis. I would say a real risk would only be realized if it produced free radicals at some point in the reaction, which is not described in this article. I would definitely miss the minty freshness! Probably causes some kinda cancer. Neat idea tho. congrats for the great news! How can i'll buy this toothbrush??. What about the minty freshness?